Originally from Cremona, the Antoniazzi family of violin makers was led by Romeo’s father Gaetano and older brother Riccardo. They relocated to Milan in 1870. 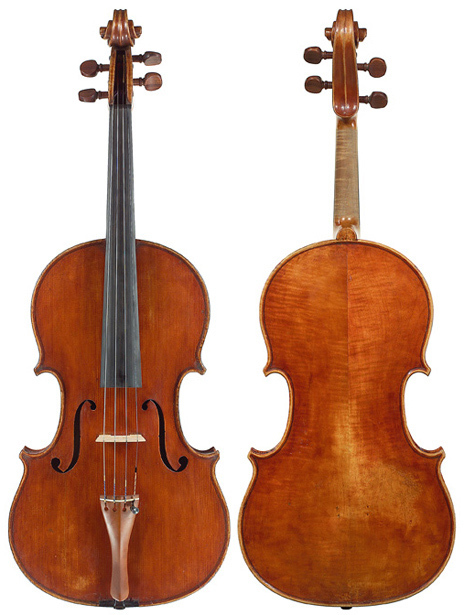 Their unique, Cremonese-influenced style had a great impact on other makers in Milan, most notably Leandro Bisiach, at a time when that city was becoming the center of violinmaking in Italy. Bisiach began as a student of the Antoniazzis, but along with his skill as a maker, he had considerable business savvy, something the Antoniazzi family lacked. Bisiach’s workshop became extremely successful and Gaetano, Riccardo, and Romeo worked there for fifteen years. Romeo also worked for Monzino and Sons and independently. He won Gold and Silver medals for his work shown at exhibitions in Milan, Paris, and Turin. His violins, violas, and cellos are sought after by musicians and admired by makers, who have copied his work. The best of Romeo’s instruments have a rich, nuanced tone with great power and depth. This remarkable viola of comfortable dimensions has those qualities in abundance.